QUIET LUXURIOUS RIDE: The vibration damping characteristics of bamboo make this bike a dream to ride. It is much more comfortable than a carbon fibre frame. PERFORMANCE ADVANTAGE: This is not just a cool bike. It is appropriate for racing and for everyday use. The vibration damping is a performance advantage on longer rides, reducing fatigue and shock associated with carbon frames. NATURAL DAMPING: The composite nature of bamboo gives it an enviable advantage over carbon for absorbing road shocks and vibrations. By absorbing shock, yet remaining incredibly stiff, the rider experiences a rare combination - a forgiving, performance frame. 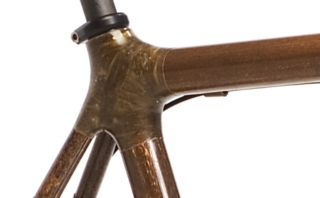 Each frame is built to order by Calfee Design USA and every frame is a unique. Bamboo tubes are selected for the weight of the rider.